Since some month I am working with MMORPG emulators again, written in C++. Because of this I needed a powerful debugging tool and so I chose GDB. I will show you some nice-to-knows for debugging with GDB on a simple code sample. I recommend at least basic knowledge of C++, Linux and debugging to understand most of the things explained in the following part. In our case the startup of the application results in a crash, due to division by zero. Because of the crash, we now can get more detailed information with the backtrace. Breakpoint 1 at 0x4004ca: file divide.cpp, line 7. Breakpoint 2 at 0x4004ea: file divide.cpp, line 9. With the “next” command, GDB will go to the next line, which is executed by the application. As opposed to this the “continue” command will simply continue the application. I hope this tutorial helps you to work with GDB and to get some personal achievements with debugging your applications. If you have feedback, regards, corrections or questions please let me know and do not hesitate to comment! In this post I will show up some dangers of the MySQL-Server usage you should care of. These are the first steps to enhance the security of your database server, because with this you are able to limit the access and the privileges. The first thing you should check and avoid on are empty passwords. On worst circumstance everyone can log on to your MySQL-Server! With a simple SELECT-Statement you can check this and identify all users without any password. To solve this security issue you need to assign a password to the user with following UPDATE-statement. This is a bad example for creating an user in MySQL. The percent sign means that you can connect with this user from any host, what can have serious security impact. There are better ways to do this. You can set exact IP-addresses, host-names or use wildcards for both ones to limit the connection possibilities of offenders significantly. The MySQL permission system is a very time consuming section. If you want to manage this correctly, you need to know all necessary permissions to every table in every database for every single user! Because of this people often want to make their life easier and so they use a simple GRANT-statement, which sets all permissions. But, as you can imagine, this can have a very bad influence on your security. If your software is for example vulnerable for SQL-Injection and you do not know this, attackers can simply drop all databases! To prevent this I recommend setting only the required privileges to the users. If you need an overview about all privileges you should have a look at the MySQL privileges section. A better way than only setting the limited permissions to all databases and tables is, setting different privileges for every table! The bind-address restricts all connections to the MySQL-Server to a given IP-address. In most cases you will see the line below commented out in the my.cnf file. This is necessary if you need to connect to the MySQL-Server from different hosts. But if you only need access to the MySQL-Server on localhost it is better and more secure to use this as bind-address, because the MySQL-Server does not listen on external connections then. I hope this tutorial helps you to secure your MySQL-Server. In fact there are much things you can do to make it more secure, but like I said this is a first step to enhance it. Before talking about MySQL performance tuning, it has to be clear which MySQL storage engine should be taken. I will talk about the two most popular storage engines: MyISAM and InnoDB. At first it is important to mention that there is no storage engine which is best of all. Every storage engine has its advantages and disadvantages, but if you clarify your needs correctly you will find the one that fits the best. In fact you do not have to use one storage engine for your whole database, but you are able to combine the advantages by using both of them for different tables. So probably the way to the best performance and usability is using MyISAM and InnoDB! This storage engine is used with simple and easy database models and purposes in general. For me the most important feature of MyISAM is full-text search. It is the default storage engine of MySQL, because its simplicity is a great advantage. You do not have to take care of any complex database models and can easily create simple table designs. Another important point is the full-text indexing, already mentioned as feature. You are able to use this for search engines in forums, websites or web-shops. Due to the simplicity there are many things which MyISAM lacks, even if it is an advantage. MyISAM is missing of data integrity features such as foreign keys. Also the missing transactions feature is bad, because queries can mess up your complete table content! Another negative point is that this storage engine does table locking. This will surely reduce performance with WRITE-heavy tables. MyISAM is the best storage engine for beginners or simple purposes, but I do not recommend using it with WRITE-heavy tables, due to table locking and the lack of data integrity and transactions. All in all MyISAM is mostly considered to be used in relation with tables of websites, content management systems, blogs, small search engines and so on. As you can see, these examples are all READ-heavy and so it is mostly used in this field. Of course this a general statement which depends on the size of the software or on specific tables. There are some cases on which other storage engines have better performance results with SELECT-statements, but this is not the standard. This storage engine is used with more complex database models and purposes in general. There are three main features which InnoDB has: Relational database design with foreign keys, transactions and row-level locking. In my opinion the most important advantage of InnoDB is the transaction feature. With this you can ensure the correctness of your data, even if a data manipulation query gets interrupted. Besides it supports row-level locking within tables, which is very important for the performance of WRITE-heavy tables. Another advantage is the data integrity with the help of foreign keys. With this you can build relational database models, needed for complex use. Moreover InnoDB not only keeps indexes, but also frequently accessed data in memory, what is possible with the buffer pool. Of course this reduces I/O on disks and due to this increases perfomance a lot! In opposite to MyISAM this storage engine does not support full-text indexing, which prevents you from doing full-text searches. Due to the fact that InnoDB maintains data integrity, designing database concepts will be more time-consuming. Another thing is that it also needs much more system resources, especially RAM. Only with this it is possible to guarantee good performance. To summarize InnoDB is a storage engine for advanced users with databases which contain sensitive data. It is recommend to use it with WRITE-heavy databases, because of the transaction feature and data integrity. Nowadays you can use InnoDB for READ-heavy databases too, because the times of slow performance are really gone. But this gets only important with huge applications or websites with huge count of visitors and changes. I hope the differences and advantages of both MyISAM and InnoDB get clear after reading this article. If you have feedback, regards, corrections or questions please let me know and do not hesitate to comment! Besides this was the first step to and the base of my MySQL performance tuning post, which will come soon. 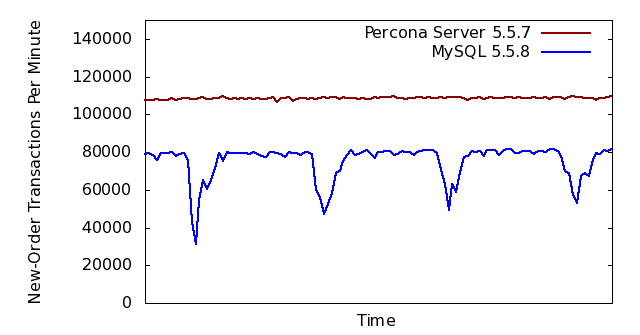 As I promised in the last post, I am going to show you how to install the MySQL-Server solution of Percona. There are two ways of installing Percona Server: Via package manager or from source. Maybe some of you think that it is not needed to install Percona Server from source and they are right. It is not really needed, but it has some advantages which you will see later on. For the sake of completeness I will show both ways. This HowTo is based on my personal purposes and needs, so there are other possibilities to get Percona running for sure. My favourite operation systems are Debian and Ubuntu and I currently use Percona-Server v5.5.15-21.0, but will probably upgrade in some weeks. I recommend at least basic knowledge of MySQL and UNIX to understand most of the things explained in the following part. The only thing you have to do is getting the signed key of Percona and adding the repositories to your source list. With this you are able to install the software automatically via package manager. You will need root access to do following actions. After that you are ready to install Percona Server yet! This version is more complex, but you have the possibility to install the application for custom purposes. I prefer installing the client previously, because it already creates the MySQL configuration files like the my.cnf in /etc/mysql/ which is not created by this installation method. Indeed Percona provides different versions of my.cnf files for different purposes, but I will topic this in another tutorial. Now we can start with the basic installation. I prefer to install MySQL in /opt/mysql, so you can specify this with the –prefix option. 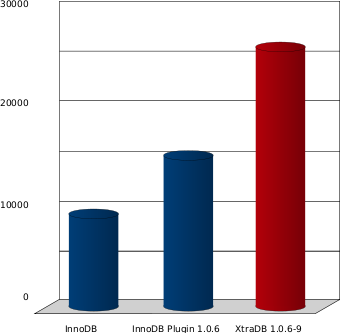 The two other options trigger the usage of XtraDB instead of the build-in InnoDB storage engine. I wrote something about this in my last article of Percona Server. For increasing InnoDB performance it is very important to use this! If you followed these steps correctly you should have a database which is almost ready to run. We will now create some files to be able to start and stop MySQL server easily and provide correct startup and shutdown behaviour with OS actions. The last thing you have to do before startup are small adjustments to your MySQL configuration. There have to be some necessary changes to get this working correctly. The advantage of my.cnf is that it has an include path for custom configuration files. So let us use this due to the fact that the content of these files overwrite my.cnf options. I just set the correct base- and data-dir of MySQL, because I prefer this setting. It is up to you how handle this. The XtraDB configuration settings I did are really important! The first one (innodb_file_per_table) is set to 1 and used for reducing file access and therefore reducing I/O. This becomes more important if you have slow disks, but is recommended by me anyways. The second one (innodb_file_format) is set to barracuda, which is the only supported table format for XtraDB. I hope this tutorial helped you to install and configure your Percona Server. If you have feedback, regards, corrections or questions please let me know and do not hesitate to comment! Keep in mind that there will follow guides for MySQL performance tuning and a backup solution for InnoDB and MyISAM tables. This blog is work in progress, so you won’t find much information here at the moment. I will write some articles and create some pages in the next weeks. The topics you will find here will mostly contain guides, tips, scripts and more about useful software I worked with. I look forward to creating some interesting stuff here and getting some feedback.